In photographs, Zachary Sealey stands out with striking blue eyes and a large number 87 on his padded shoulder. He picked the number as an homage to New England Patriots tight end Rob Gronkowski, said South Beach Seahawks Youth football president John Wallace. 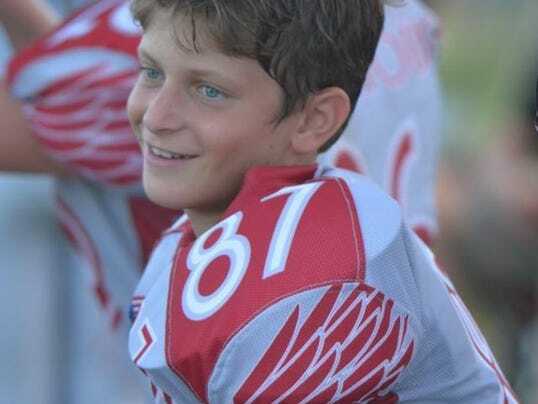 Now, football players and cheerleaders from around the county will be wearing it as an homage to Zachary, who collapsed and died suddenly at DeLaura Middle School in Satellite Beach Monday. Not only will players on the South Beach Seahawks have the decals on their helmets, but so will varsity and junior varsity football teams at Satellite High School, Wallace said. He described what it was like Monday night sitting down with the Seahawks players, who were "completely devastated" by the loss of their friend and teammate. Some of the kids, he said, had been with Zachary when it happened and watched him be taken away in an ambulance. "Those kids were pretty upset (Monday) night. We as coaches tried to be there for them to let 'em know this is gonna hurt. It's just a horrible thing. It's OK to feel. It's OK to cry. It's OK to be upset," Wallace said. "We're all going to get through this. We're gonna be there for Zach's family." Brevard Public Schools officials have still not released any information regarding the cause of Zachary’s death. Teachers and administrators responded quickly, rendering CPR to him until emergency units arrived, according to spokeswoman Jennifer Wolfinger. School psychologists will be available on campus for as long as they're needed, she said. "The faculty and principal here are devastated ... it's just so sad. Our hearts are with the family," said Assistant Superintendent Matt Reed. Zachary, a multi-sport athlete who participated in Taekwondo and baseball as well as playing wide receiver for the South Beach Seahawks, was shown an outpouring of support from the community, Wallace said. "In times like these, it's important to remember that rivalry does not matter. Ultimately, the game of football does not matter. The bonds and relationships forged throughout participation, however, matter intensely. Zachary was someone's son, someone's friend, and someone's teammate." Wallace said he wasn’t surprised by the amount of love he’d seen from everyone. "He was very athletic, active, outgoing — just a great kid to have on your team ... He cheered for the kids. He was a great teammate to have. I just hope the people can understand that this is just a really special kid."